I get a lot of people contacting me saying their dog loves jumping on/over things, or climbing on things, or running really fast, or chasing other dogs around, so they think they’ll love agility. Although this might be true, and those are useful things for a dog to enjoy doing in order to enjoy agility, I’d say that this doesn’t necessarily mean for sure that your dog will love agility. I’d say that Lu loves most of those things, but she doesn’t love agility. So how can you tell if your dog will love agility?! I actually think that most dogs, if trained well, will enjoy agility – it means playing with their favourite person, getting rewards, learning, eating and interacting with YOU! For most dogs, these are all awesome things to be doing, so they’re going to enjoy it. For some dogs, it means doing a job – for these dogs, they’re going to enjoy doing agility even more because they need to be doing that job. Loki is a perfect example of this kind of dog, and he feels personally responsible if he has trouble with something or isn’t doing what I’m asking of him. Dogs who love to work for something (some kind of reward) will probably love agility. When I say “if trained well” above, what I mean is that they don’t have too much pressure put on them when training. I think this was a mistake I made with Lu early on and is something I’m still working on fixing. I expected too much of her, and for her to do things she didn’t enjoy doing. Because she ran around the backyard and loved chasing us, I expected her to love agility, and when she didn’t, I put more pressure on myself, and on her, to do it how I expected her to. What will really help a dog enjoy agility? If they chase balls and tug on toys- these aren’t necessary, but they sure are helpful! Life is made easier by a dog who has passions, whatever that may be. For Lu, it’s playing with the water coming out of the hose. For Loki, it’s anything, but I know that balls are #1, then tugs, then food. For Mal, food was always king! I think any breed can play agility. There are some great pugs competing, some whippets, an Afghan hound, a Greyhound, some toy dogs, Wheaten Terriers, and of course a plethora of working dogs. What dogs might not enjoy agility so much? Dogs who are reactive or find being around other dogs stressful might not enjoy agility. This isn’t to say they can’t do it, or it’s impossible, but it would take some clever thinking and additional management to make sure that they, and the other dogs in the class are safe. Dogs who are unfit and overweight would find agility hard. Again, this isn’t to say they can’t do it and won’t eventually enjoy it, but try running your fastest when you’re not feeling your best. It’s unfair of us to ask them to sprint, jump and turn when they’re carrying extra weight. Old dogs probably won’t enjoy agility. Teach them tricks to use their brains, but maybe asking them to run fast, jump and turn isn’t good for their old bones. Dogs who have low passions (or drive) present us with an interesting challenge, and although they may come to enjoy agility and may even love running competitions, they will require some clever thinking about how to make them find the game fun and interesting. If you think your dog might enjoy agility, check out my blog-post on some ways to get started without even going to a class, or drop me a line to sign up for our Foundations class. I like blogs that do columns, so I think I’ll put some exercises and tricks here that will help your dog get fit and conditioned for agility (as part of a wider conditioning program, regular walks and runs, etc). Obviously if your dog has any injuries or issues, consult with a vet or rehab specialist before doing any of these exercises. This is a super easy exercise that really helps strengthen so many parts of your dog. Deep leg muscles, core stabilising muscles, back muscles, shoulder muscles. This was prescribed as part of Lu’s rehab for her iliopsoas and I do it with Loki as well to keep him nice and strong. Setup: Non-slip floor for beginners, then a peanut ball, some treats or peanut butter or something. Get your dog standing nice and straight on the floor (or, eventually on the peanut). I usually have the bowl of treats directly in front of my dog so they’re looking forward. Lift one leg. Hold it up for a minute (or start with whatever they can do – 30 seconds or so). Place it down. Lift the next leg, hold it up. Repeat for each leg. Easy! Tips: You want your dog to not be leaning on you like a crutch. You might find they will put a lot of weight in your hand at first but as they get stronger they will rely on you less and less. You should feel them twitching as they adjust and shift their weight in tiny little ways. If your dog becomes un-straight or is standing weird, I tend to make my dog either sit or drop, then stand up again from that position. Some dogs who are used to shaping or clicker training may find this hard at first as they want to offer behaviours. A friend of mine places her hand on her dog’s chest and she seems to know that this means ‘stay still’ – with Lu, I gently rub her tummy. This also helps stop her from sitting or laying down before the time is up. In order to make the exercise more difficult, once the dog can do it easily on the floor for a minute, move to a peanut pushed up against a couch or chairs to stop it moving. Then have the peanut be more ‘free’ but still supported with your hand to help keep it still. You can see I’m just resting my knee on it in these photos. I don’t use a traditional human ‘swiss ball’ as it makes them roach their back too much. This peanut I bought from a yoga store near the city so you don’t have to specifically get dog-made equipment. 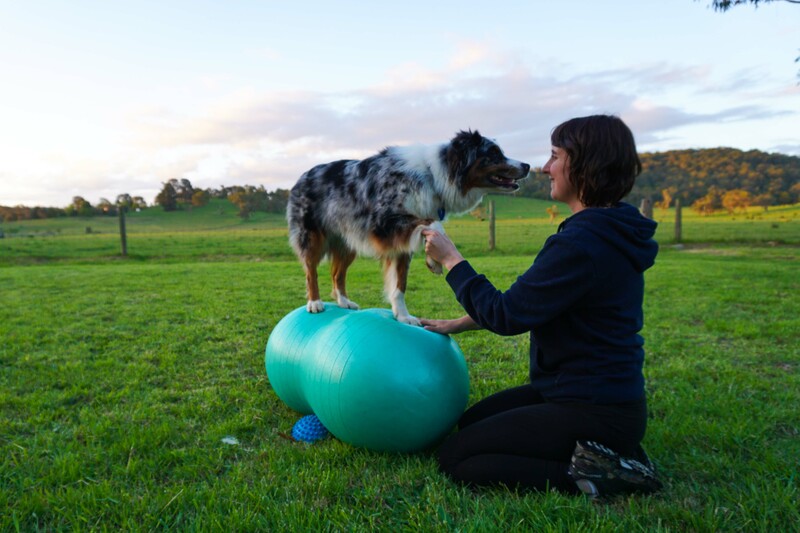 So, you have a dog, you think your dog would like to do some agility, but you’re not sure where to start (apart from signing up for one of our classes! 😉 ). Here’s 5 tips for getting your dog agility-ready. Clicker train! Yep, not all our tips are going to be agility specific but they’re all going to be really useful. If you’re not sure what I’m talking about, do a quick google-search for clicker-training. Basically, you have a little ‘clicker’ that makes a noise. That noise marks the EXACT moment that your dog did something wonderful and that a reward is coming. The brilliant thing about clicker training is that you can be so much more precise. You’re saying THAT is the behaviour I want, rather than rewarding whatever happens between the dog doing the behaviour and getting to you for its reward (or you fumbling in your treat pouch to get a treat, etc). For example, when I train my dogs to do running contacts, I need to click them for their feet hitting the contact zone. If I didn’t clicker-train, how would I tell them which attempts were right, and which weren’t, and what part of their performance am I rewarding if they run down the plank and there’s no indication that they’ve done the right or wrong thing until they get back to me? By clicking, they are reinforced over and over again for striding in a particular way, for not leaping and for having their feet in a certain place, rather than being rewarded for fetching the ball after the dogwalk, or doing the tunnel, or any of the behaviours that come after that very split-second action. Clicker training is SO important to understand for agility, I can’t stress it enough. Play. Play with your dog, find out what motivates them. Some dogs are easier to motivate (Loki!) than others (Lumen). But most dogs love something. Maybe they love sausages, maybe they love tugging, maybe they love chasing a ball, maybe, like Lu, they love chasing water that comes out of a hose, or a broom! Whatever it is, find that thing and start using it. Ask for a sit, play. Ask for a drop, play. You want your dog to start working to play, and playing to work. For my border collie Loki, it’s all the same. Play is play and work is play and everything is awesome. How could you not want to play with this cuteness? Socialize your dog. I know, you’re thinking: “but socialisation is for puppies” – well, yes, and that’s the very best time to do this, but you shouldn’t stop there. Whenever I’m near a playground (when there’s no children on it, of course), I get my dogs exploring. They put their feet on swings, they go through weird tunnels, they climb on platforms, they balance on beams. So much of agility is about confidence on and in obstacles, so why not start it in the real world and get your dog to LOVE interacting with different things. Teach your dog to wrap an object. I have a video of Lumen learning to do this with a stool here. She already knew how to wrap but hadn’t done it with this object before so you can kind of get a sense of what I’d be looking for when training it. This might seem like a bit of a strange one but hear me out. Once your dog can wrap an object, you can start sending it out to wrap trees. Then you can do little sequences and figure-8s with tree-trunks. This translates REALLY well to jumps and jump wings. I taught Loki how to do sequences just by wrapping trees (see a video below). Once he got to jumps he was already looking for obstacles so beautifully that I never had to try and get him to go over a jump – he just looked for an object and went and did it. This also helps later on with your dog turning tight and doing distance work independently of you. There are so many benefits to doing wraps. It’s hard to take a photo while your dog is wrapping something & you’re trying to run away and throw a toy at the same time! Play some running games with your dog. Have a toy- tug or tennis ball, whatever your dog enjoys, but toys are easier to use than food. Put your dog in a stay or have somebody hold the dog. Walk out a few meters, release the dog, and run! As the dog catches you, play a great game. You can do this but instead of playing straight away, throw the toy ahead of you and say “Go go go!”! This teaches the dog to run on without waiting around for you. Eventually, you could wrap your dog around a tree and run off, with your dog chasing you down. Agility is so much about chasing and running together that you can build that sense of playfulness in these games. Also you’re working on your stays, building that anticipation for the release, and that bond through playing. Here is a video of Loki putting so much of this together- the wraps, the running, the playing. 6. Bonus tip. 😉 Getting your dog to learn tricks through clicker training will help them immeasurably in agility. Doing tricks helps them learn how to learn, and to love learning. 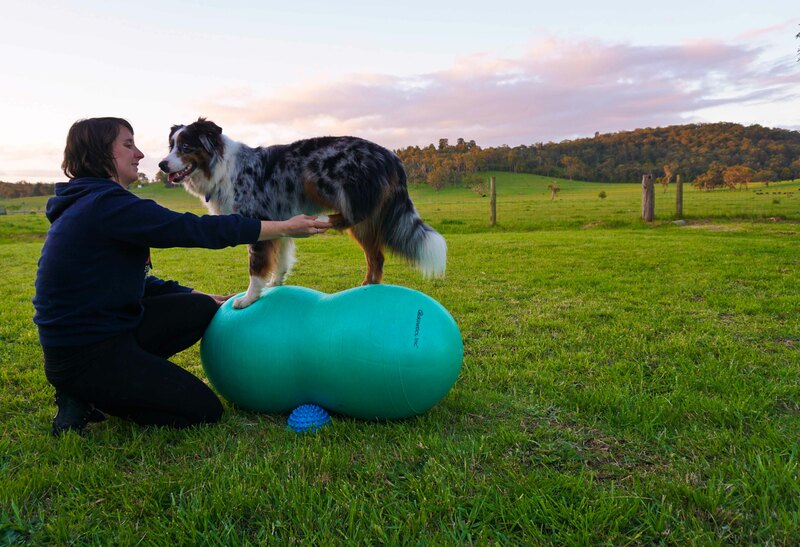 Tricks that are particularly useful are those that help the dog learn about his body, so targeting with front and rear feet, lifting side legs, balancing on wobble boards, sitting pretty. If your dogs know how to use their hind-end, and how to move their bodies, they’ll be much better able to understand what you’re asking them to do when you want them to turn, or target something, or kick their feet over a bar! Hopefully this has given you some ideas. The great thing about all these tips is that they’re easy to do with puppies or young dogs. If you’re looking to take a class with me or anywhere else, these are some easy, fun things you can do with your dog. Practise your stays and your recalls as well, and you’ll be all set not only to get into agility, but also you should have a stronger relationship with your dog, too. And that’s the coolest part! I thought I’d post our training schedule up here. It was something I asked Silvia about during her class and something I’m constantly trying to find the right balance in. 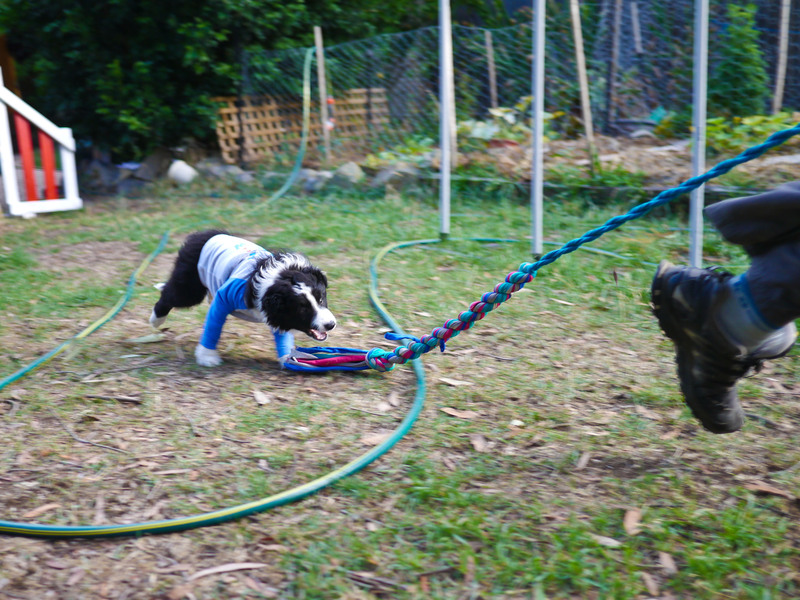 Maybe you’re just starting out in agility training – that’s great! But you need to remember your dog’s fitness is so important. So how does our week run? I’ll admit, I’m not great at keeping a schedule, so this often changes day-to-day, depending on the weather, energy level of the dogs (if Lu is being particularly happy or keen, I’ll train her in agility), whether I have other commitments, etc. But this is a rough outline. Monday-Friday: Morning walk for 30-45 mins. Nic sometimes takes Lu for a 5km jog. 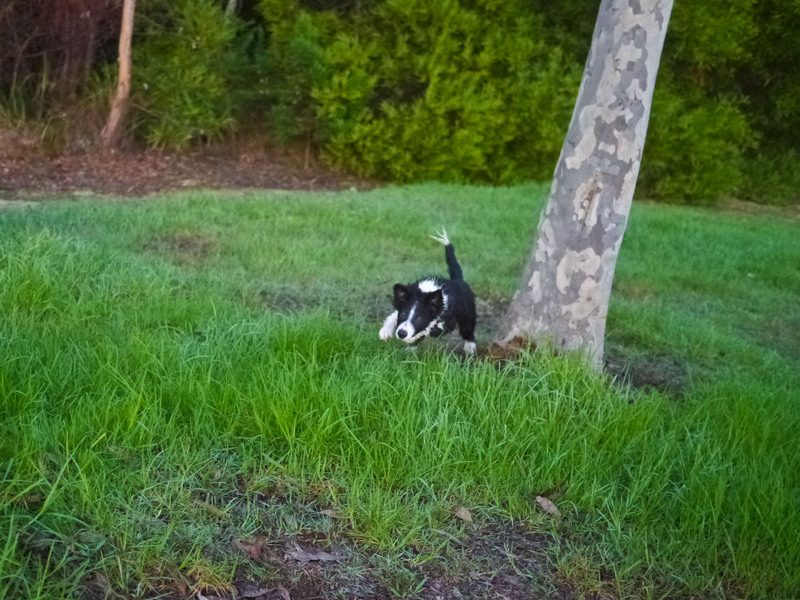 Play ‘controlled fetch’ with Loki in the bush to help improve his coordination. Let dogs run around in the yard while I get ready for school. Crate Loki, Lu and Mal are in the lounge together. May give the dogs a Kong. When I get home, we might do 30-45 mins of agility (split between Loki and Lu) but more often than not, we’ll pack up the car and head out for another bushwalk, usually about an hour. Come home, dogs can have a run together if it’s still light (important since Lu is currently on-lead during all our walks) do stretches and core exercises with Lu, and the same for Loki if there’s time. Occasionally either Loki or Lu will come to school with me where the kids will walk them around during lunch and recess – this is a pretty slow, ambling walk though so I don’t necessarily count it as exercise. I try and fit in a rest-day but our walks are pretty relaxed with Lu on lead so a day where we just walk kind of counts as a rest. In terms of the agility training, I try and mix it up: 1 day of running contacts, 1 day of weaves for Lu, 1 day of wraps for Loki, 1 day of tunnels for Loki, a break, back to running contacts, etc. I don’t want to do 2 days of wraps in a row, for example. Saturday was traditionally our day to go to an external club for training, however we haven’t been for a few months due to Lu’s rehab. After training, we would usually go for a beach run for about 2 hours. On a big day like this, I would try and do a few of Lu’s stretches after the agility training, but not the whole routine. We also try and mix it up and throw in some herding every now and then. I find that mentally, a half day of herding does wonders for my dogs, who sleep away the rest of the day! Sunday is either a ‘busy at home’ day, which means lots of running together in the yard, helping dig holes, jumping in water troughs, etc., or we aim to do another 1+ walk together. Stretches and balance exercises in the evenings. Writing this, I realise that we don’t do nearly as many tricks as we used to. I’m not sure if this is necessarily a bad thing as I feel that the time taken doing tricks is now being used to walk and condition the dogs instead. Because of the strength and balance exercises, we do still get some tricks in there – part of Loki’s repertoire is his ‘sit pretty’ and ‘side legs’ tricks, and him learning to hold his nose against my hand during stretches. So in a way there are tricks incorporated into our strength, stretch and balance time, but not in a formal ‘trick teaching’ kind of way. I once heard a Canine Rehab person say that for every hour of agility you should be doing 2 hours of conditioning. I’d say that we are working well above that, and I’m happy. I feel like Lu is stronger in her core than ever, though her cardio fitness has suffered as a result of the on-leash walks and 6 weeks of restricted exercise, and I feel like Loki will have a good solid base as his training continues and will hopefully help prevent injuries going forward. Do you consider conditioning to be an important part of your training routine, or is it something you’d like to consider more? 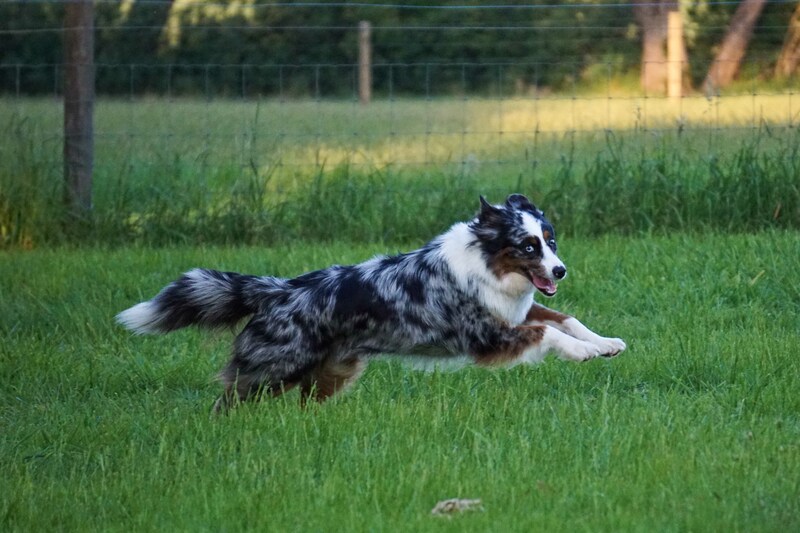 I have been training my Aussie girl, Lumen, to do running contacts for both her A-frame and Dogwalk. This means I want her to just RUN, full speed, up and over, and adjust her stride so she will plant a paw or two in that contact zone as she runs off. She has amazed me with her ability to understand the ‘stride adjusting’ thing but unfortunately with so many breaks lately, has lost her speed and confidence. I will also be training Loki to do running contacts, however I think he can also have a “hit it” command to drive into two-on-two off position. He’s such a drivey puppy that I don’t see this being a problem for him. However, I have lots of people ask me about training running contacts and I usually respond the same way: I love, running contacts. It’s my happy place. When everything else seems tough, running contacts make me feel joyful. To see Lu do it how she used to – to fly over a dogwalk in 3.5 strides, a dog who isn’t terribly motivated or fast as a general rule, it takes my breath away. But, they’re not easy. Oh, how I cried when we raised the plank and after 4 sessions she was still leaping off. How I agonised about whether to drop back down or keep persevering. How I had to train 4-5 times a week on the dogwalk to give her enough practise. How turns are still giving us angst, and we haven’t even started on the hard turns yet. How just when you seem to solve one problem, another one comes up. How, even with the very best dog (Loki), there are still issues (going too fast, crashing and losing confidence). But, with a dog like Lumen, there is no way I could have trained a stopped contact. She would NEVER drive into a position, and making her stop would absolutely drain the motivation out of her. If you have a dog who lacks motivation, maybe this is the method for you. But you are going to have to RUN. You’re going to have to be prepared to blow courses on purpose (like when they put an off-course jump 4 meters after the end of the dogwalk and you’re meant to take the one 90 degrees to the side), and to experience frustration when what you’ve trained doesn’t come through in competition straight away. Be prepared to become very good at making planks of wood, or dogwalk planks, not wobbly when perched precariously on bricks and cinderblocks. I don’t think running contacts is for everyone. I think you need your own dogwalk, or the ability to access one at least 4 times at week in the later stages. You need one that is fully adjustable, or to be able to acquire enough materials to raise it from 20cm all the way to full height. Some of the ingenious ways people do this is amazing, but I wouldn’t want my dogwalk supported by pallets and garden chairs, personally! I think you need to have a keen eye – watching those feet hit is HARD at first, and you develop the skill more and more but it’s something you need for sure. If you can’t see those feet hitting when your dog is running at full speed, you can’t click for hits! Which brings me to my next point – you need to be fast off the bat with the click, but not too fast if your dog leaps. I’m guilty of many accidental clicks, myself! You need to be able to really jackpot and celebrate with your dog. I’m talking cheering, sweet-talking, partying, dancing. Whatever it takes. Silvia Trkman says in her DVD that if she jackpots her dog, the whole village knows about it. So, is running contacts for you? If so, great! Enjoy! It’s an absolute emotional roller-coaster but SO worth it. And if not, that’s cool too- I can help you train two-on-two off as well. I have my own personal blog elsewhere, where I complain about the trials and tribulations of my own training, but what I thought I’d do here is actually put up some helpful information, cross-post some of my most useful posts from my other blog, and discuss training techniques, ways to train certain things, and other agility-class related things as they come up. If there’s something you’d like to find out about or to learn more about, leave me a comment and I’ll do my best.